Are you ready for the race? Registration is available at www.festivalinternational.org/5k. Take a look at last year’s photos, results, and more while you’re there. The annual Courir du Festival 5K, presented by Stuller winds through tree-shaded neighborhoods of downtown Lafayette, LA. Festival-goers of all ages run or walk with us through the heart of Cajun Country. Your 5K participation is another way to support Festival International and we appreciate you, runners! 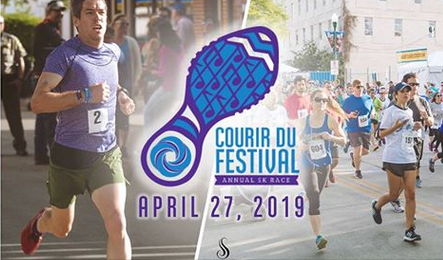 Not only do you receive a Courir 5K T-shirt, but crossing the finish line into Festival also means live music, food, and drinks will be waiting for you.